"My next several hours were spent learning how to play tak. Even if I had not been nearly mad with idleness, I would have enjoyed it. 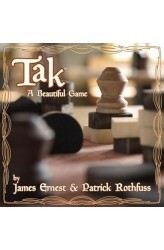 Tak is the best sort of game: simple in its rules, complex in its strategy. Bredon beat me handily in all five games we played, but I am proud to say that he never beat me the same way twice." -Kvothe Tak is a two-player abstract strategy game dreamed up by Pat Rothfuss in "The Wise Man's Fear" and made reality by James Ernest. In Tak, players attempt to make a road of their pieces connecting two opposite sides of the board. https://www.youtube.com/watch?v=Tcijn67kGjk ..